Cameron McGiffin is having another fine season. Phantoms possess the meanest defence in the English Premier League - something which came as a pleasant surprise to one of the men who has made it possible. Teenager Cameron McGiffin has been an impressive performer in the early weeks of the 2015/16 season. He is part of an all-British backline, in front of star import goalie Janis Auzins, which has conceded just 36 goals in 14 games to date this term. But the former Slough man admits he didn’t realise just how good they have been in that respect until it was pointed out earlier this week. McGiffin said: “I try not to look at stats - and I think most of the guys are the same - so I didn’t actually realise we had the best defensive record until it was pointed out to me. “It proves that we have a really strong core of guys and it is great to be a part of it. “I’ve really taken it upon myself to try to improve this season and hopefully people will notice that. McGiffin (19) helped Phantoms lift the English Premier League play-off crown in his debut season with the club and has rapidly established himself as one of the most promising British blue-line prospects. And he has also paid tribute to the club’s super supporters who are helping to turn Planet Ice into a venue to be feared by opponents. The players and fans will need to be at their best on Sunday when a highly-rated Guildford side roll into the city (5.30pm). But, before then, Phantoms are seeking atonement for their disappointing defeat at bottom side Hull last Sunday when visiting Bracknell on Saturday (6pm). 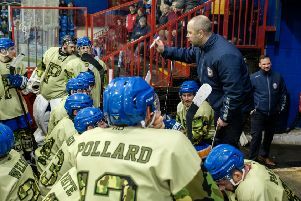 McGiffin added: “Our rink has without doubt the best atmosphere in the league. “The fans are loud and give us brilliant backing in every game. “We can be guaranteed good support regardless of who we are playing and I’m sure that will be the same this weekend. “We’ll be hoping for a good result against Guildford just as we will at Bracknell. “It was an eye-opener against Hull last weekend and a lot can be learned from it. Import forward Milan Baranyk played no part in the Hull game due to a knee injury sustained the previous weekend against Telford. His progress will be monitored ahead of this weekend. Fellow frontman Lloyd Gibson also missed that match as it is understood his kit failed to arrive.